British Columbia: Self-Published. Hardcover. B002D03R0U 270 pages. References. Numerous reproductions of archival black and white photos. 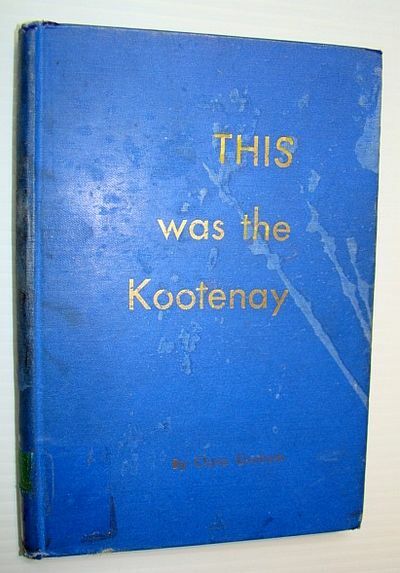 Title of the thirty-one chapters include: The David Thompson Party; Fort Kootenay; Gold on Wild Horse; Old Times on Perry Creek; Two Isadores of East Kootenay; International Railway Rivalry; Steamboat Days on Upper Columbia. The North Star Mine; Sullivan Mine Early History; Pierre - Kootenay Indian; Building of the Crowsnest Railway; Early Cranbrook; THe Frank Slide; Fernie; The coming of the Automobile; The Blue Bell Mine; Early Days in Kaslo; Beginnings of Nelson; Rossland Camp; The Salmon-Beaver Valley; The Doukhobors; and many more. Contents moderately toned with age. Heavy external wear and soiling. Usual library markings. Back free endpaper removed. Binding intact. Not pretty but a worthy reading copy. (Hale & Barman #359) . Fair. 1963. First Edition.